Trading online is a great way of expanding your business and extending its reach across the globe. For many businesses, ecommerce is the only means with which they sell their goods. If you are looking to setup an ecommerce site then it’s vitally important that you have a website and a platform capable of growing with your business. The last thing you want is to have to scrap it all and start again in a few years, as this is both very expensive and very time-consuming. So, how can you ensure that you create an ecommerce website that you won’t outgrow? It’s vital to get the basics of what you want to achieve right from the start. Decide what you want to offer and think about why it’s different from what other people are selling. Check out your competitors’ websites and see what they are offering and how. It’s not usually a good idea to compete in a race to the bottom on price; instead, look at how you can add value, perhaps by offering gift wrapping or extras related to the product. It’s important to set a budget too. Decide how much you want to spend on setting up a website and work out how much you will need to sell to recoup that cost. 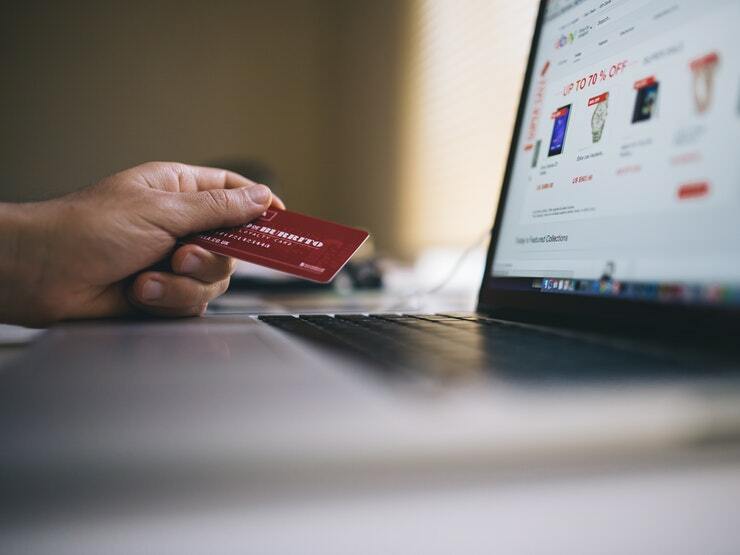 Building an e-commerce site from scratch is costly and time-consuming, so you’ll probably want to invest in a web developer to help you put the site together. You should first choose what kind of platform you want to use though. There are loads of off-the-shelf ecommerce packages, such as Shopify or Magento. These not only let you sell from your own site but via established platforms including eBay and Amazon Marketplace. They are also relatively simpler to setup than building a site from scratch and also feature a range of add ons and extras to help you with everything from SEO to dropshipping. Getting the platform right is important as once you’re set up and running, it’s a very difficult exercise to swap your site over to another platform. It’s important therefore to research each platform and understand what it is you want to achieve from it. Having established what it is that you want to achieve from your ecommerce site you can turn your attention to the site design itself. The look of your site needs to reflect what it is you are selling. A site whose purpose is to sell tickets online for music concerts may want a modern and funky vibe. Alternatively, a website that’s selling formal evening wear may opt for something far more traditional and refined. Getting the look and feel of your site right is essential if you want to really grow your brand online. It can help to take a look at what your competitors are doing online but never try to emulate or copy what they’re doing wholesale but, instead, try to take lessons from it. What does it do right? What does it do wrong? You might find that there’s a particular style used by people in your sector. Most ecommerce platforms offer a range of templates so you can build something to suit your needs but still have it look distinctive. Once you’ve built the site you need to test it and make sure everything looks and works as it should. It’s a good idea to get someone else to help here as it’s easy to overlook issues such as spelling errors. You need a site that’s reliable, so choose who you want to host it with care too. Some platforms offer their own hosting, whilst with others, you need to find your own. Take a look at independent reviews and see how other people rate the service. Cheapest may not always be best here. Similarly, consider how you are going to take payments; most ecommerce platforms are able to handle credit cards and services including PayPal. Make sure your chosen provider supports the services you need and has appropriate security controls in place. They must comply with PCI DSS standards. When your site is finished and live, you need to make sure that people can find it. Having a fully researched and comprehensive SEO strategy for your ecommerce site is an absolute must. This will ensure that your site ranks well in the search engines and will ultimately help you deliver traffic and sales for your business. This means ensuring that your site contains keywords appropriate to your business sector, again research successful competitors to see what works and making sure that your content is kept up to date. Factoring in SEO should also inform your choice of ecommerce platform. From Shopify to Squarespace, not all ecommerce platforms are as SEO friendly as each other, so do your research and try to find one that you or your SEO agency can work with. If you're new to all of this (or even if you do have a bit of knowledge) then there really is no substitute for working with professional web developers and SEO people. A quick search online will bring up a host of local providers so take the time to research a few and get an idea of pricing so you can budget for it, as this initial investment will always pay for itself many times over further down the line. It is hard to save money. Many of us are paying more in bills and our paychecks are not growing. However, it is still important for you to try to save money for a rainy day and an emergency fund is a great idea to cover unexpected costs. There are several things that you will need to plan for. Chances are your car is one of your most important possessions. You need it to get just about everywhere. That is why if it breaks down, then it can create a major inconvenience for you. Fortunately, if you budget for car repairs, then you can get it repaired quickly. There are also other things that you can do to protect your car and reduce the need for repairs. 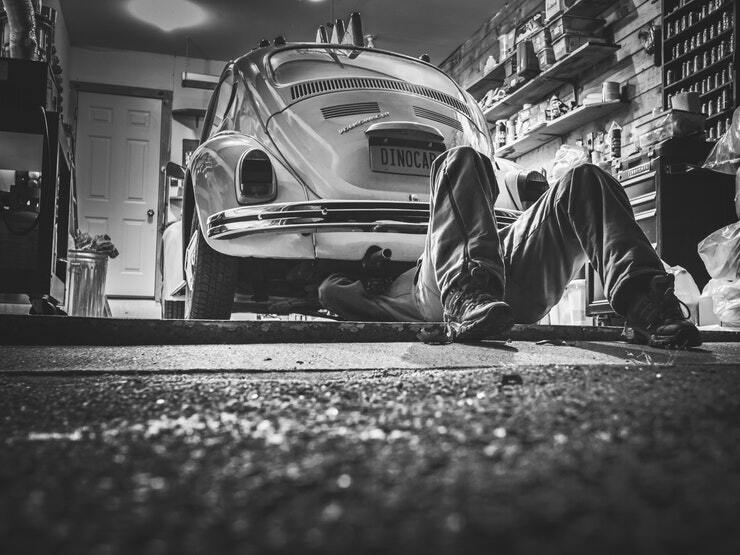 You can keep your car functioning properly for a longer period of time by getting regular maintenance. You can also protect your car by driving safely. Your home appliances are guaranteed to break down at some point. Structural components like the roof and foundation can also fail over time. It is a good idea to set aside at least one per cent of your income for getting home repairs done when necessary. You should also follow up on home maintenance on a regular basis. A vacation is something that you typically plan for in advance. However, there may be times when you have to go out of town on short notice. For example, you may have to travel due to an illness or death in the family. This is not something that you can really plan for. Sign up to hotel loyalty schemes that will give you a free stay is one way of dealing with this but if you don't have enough points, your emergency fund can also help in these circumstances so set aside some money for it. If your pet is seriously injured or ill, then the cost will likely be the last thing on your mind. However, the massive cost is something that you will be faced with after the emergency is over. Consider paying into a pet insurance scheme to cover these costs, alternatively saving an amount for unexpected bills is a good idea so you are not hit with a massive bill if your beloved pet gets ill.
We are lucky in the UK that we have the NHS, but if you want to go private, health insurance is designed to cover your doctor's visits, prescription medication, and hospital stays. If you don't have this cover you may have to wait a long time to be seen by a specialist. Paying to go private is an option and having an emergency fund to do this is another good idea if you don't want to go down the health insurance route. As we get older this is one thing that we need to think about. With the average funeral running into thousands then having a lump sum set aside for funeral bills means our loved ones won't have to worry about this expense at this distressing time. Life can sometimes hit us with things that we do not expect. However, if you can plan for unexpected emergencies, then it will be easier to deal with them. Pet emergencies, unplanned travel, home repairs, car repairs, and medical bills are some of the things that you will need to plan and save up money for. Let me know, do you have an emergency fund? We like Bristol. It's a great city with so much to see and do and some fabulous shopping. 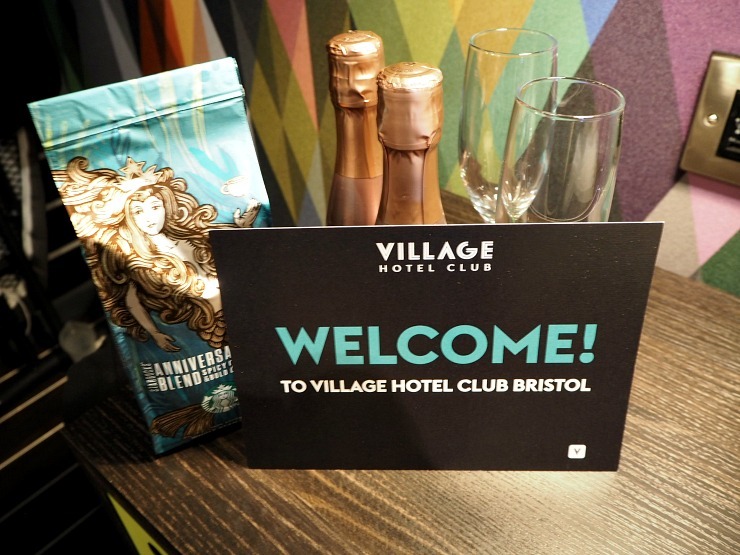 So when we were invited on a press trip to Bristol to stay at the Village Hotel Club Bristol and cover some of the events at Bristol Fashion Week then I could hardly say no, now could I? 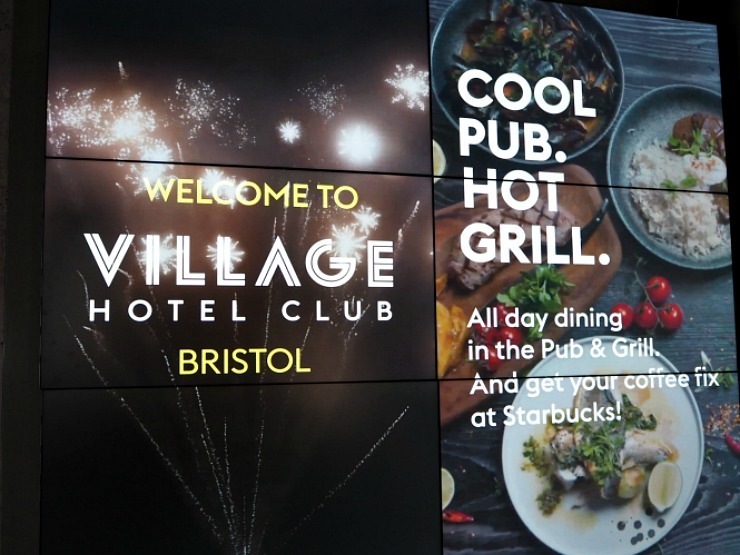 The Village Hotel Club Bristol is a newly opened hotel, a short drive from the city centre in Filton, and less than two miles from fantastic shopping at The Mall at Cribbs Causeway. We checked in quickly with the receptionist who was cheerful and informative. There was also a self-service check-in available too. First impressions of the hotel were good. Everything was clean, modern, cool and contemporary. 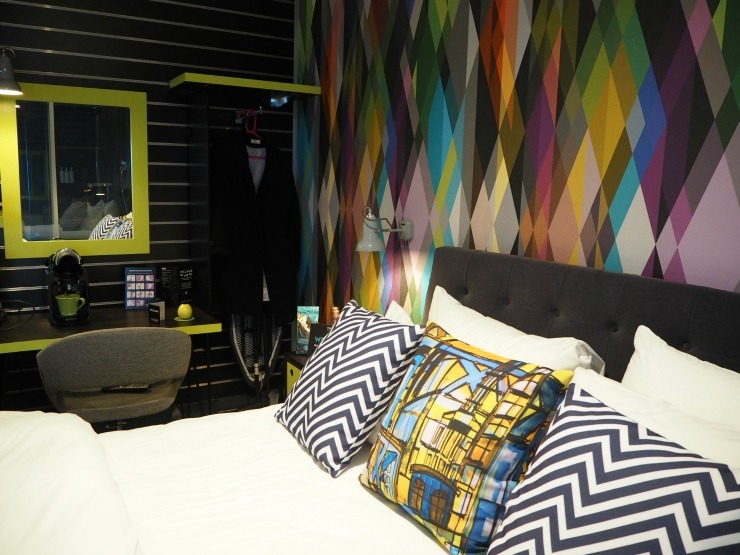 I really liked the bright decor! 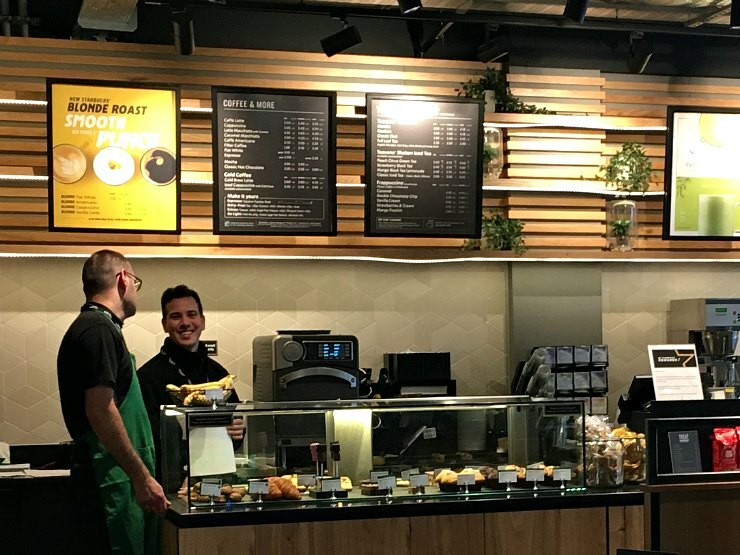 In the foyer, there is a Starbucks coffee shop, perfect for your morning Americano or mid-morning snack and also the Village hotel 'Pub and Grill' for all-day dining. 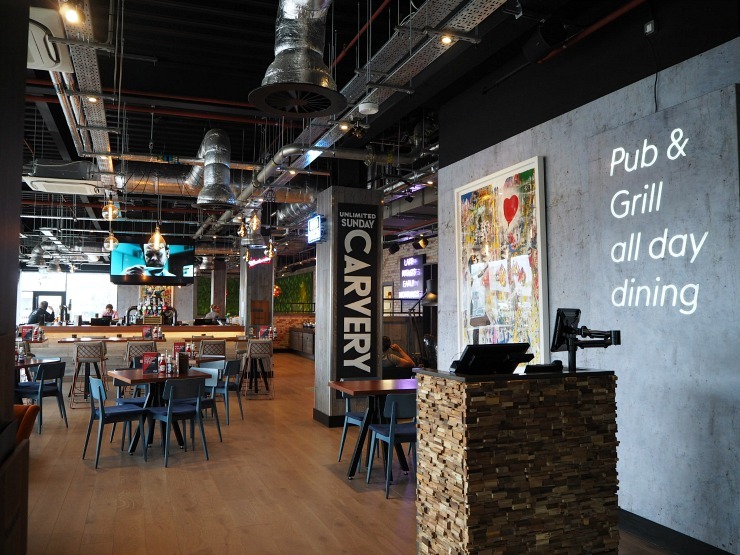 We would be eating in the Pub and Grill the next day so more of that later. Our room was a club room on the 5th floor and it really had the wow factor. Now I have to admit it wasn't the biggest room in the world but it made up for this in the decor, the room features and technology. Firstly, how cool is this decor? I am not a fan of the beige and browns you get so often in a room so this made a refreshing change. 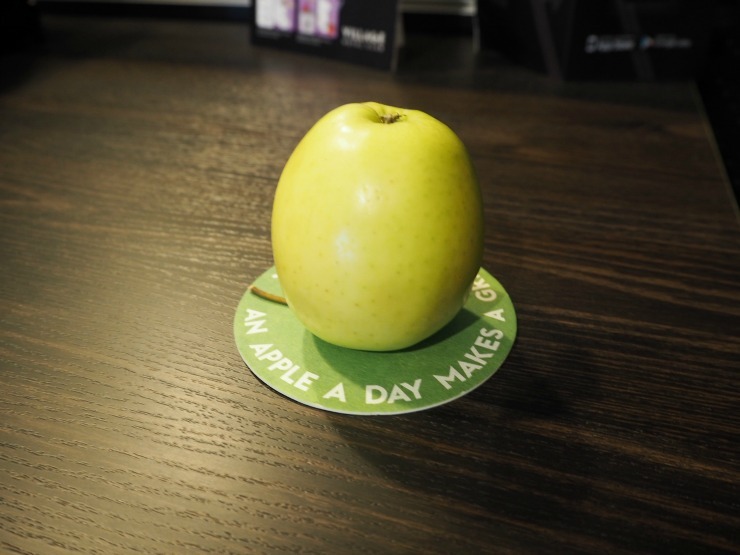 Rather than some soggy biscuits, an apple was complimentary in the room (It would have been nice if we had two though). 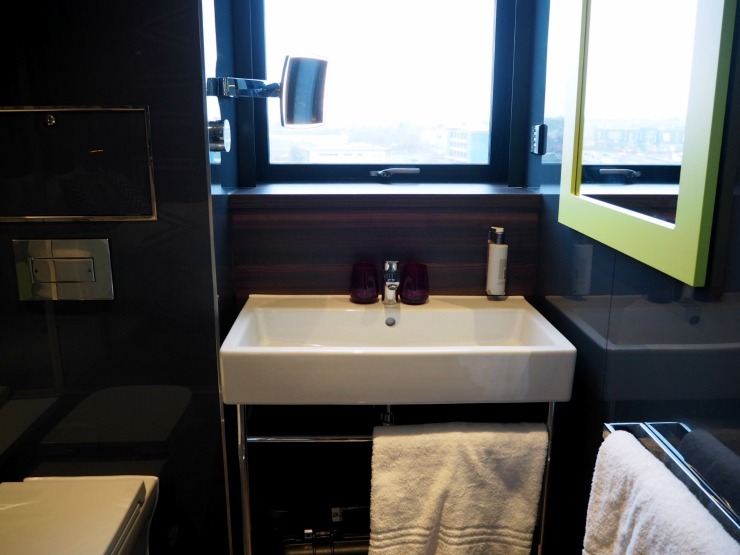 The bathroom was super modern and included features such as electric blinds, a magnifying mirror with adjustable lighting and a huge rainfall shower. I was pleased to see proper size bottles of shampoo, conditioner and body wash. So much more eco-friendly than the tiny bottles of toiletries you get in most hotels, with all the plastic waste. 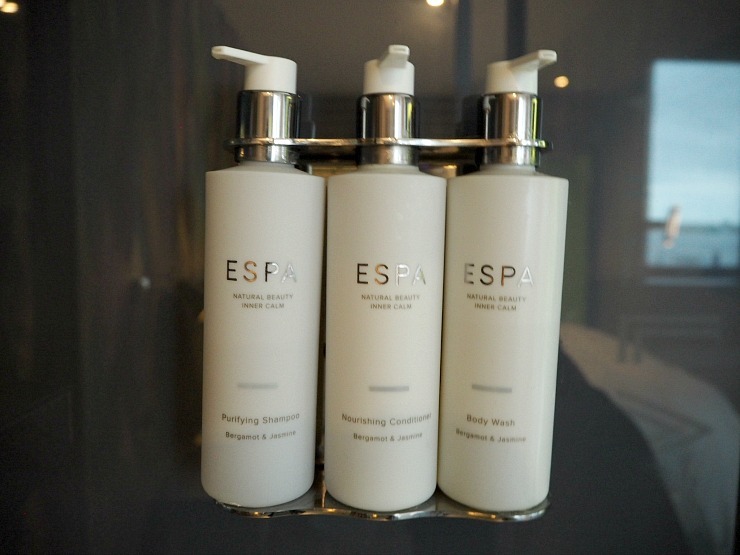 The ESPA products smelt lovely too. Other eco-friendly features include the half flush on the toilet and the ability to use the smaller shower head instead of the rainfall shower. A quirky 21st-century feature of the bathroom was the privacy door. As the bathroom door is glass, at a touch of a button you can make the glass opaque so no one can see you. Such a cool feature. If you are not that familiar with the person you are sharing a room with though, it could be a bit of an issue, the sound from the bathroom does carry, so best to book a separate room. 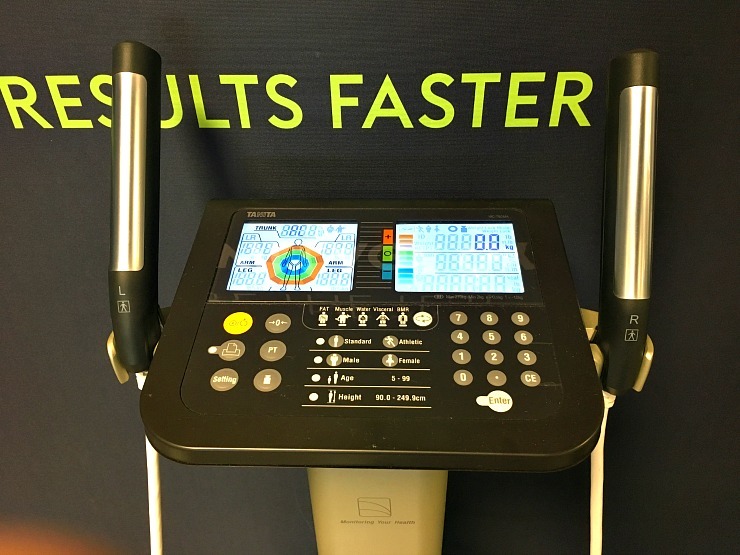 As there were so many interesting gadgets, there was a sheet in the room explaining these and how they worked. 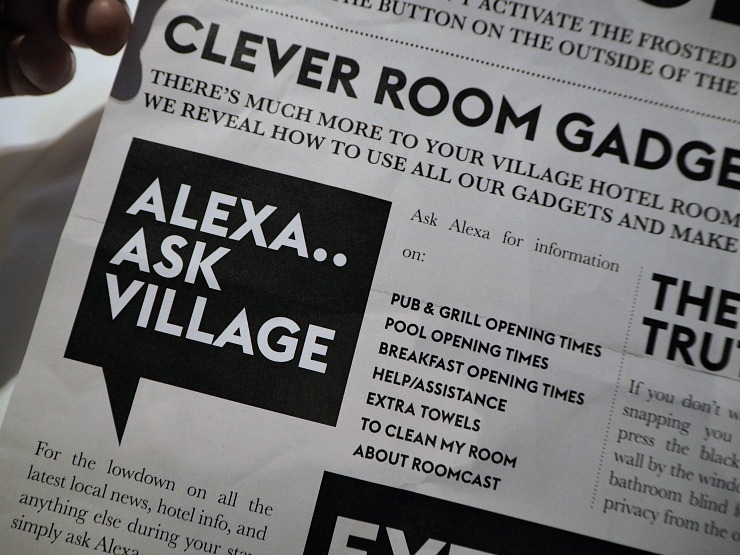 The room had a Tassimo coffee machine, Dyson hairdryer and an Alexa - Amazon's virtual assistant. 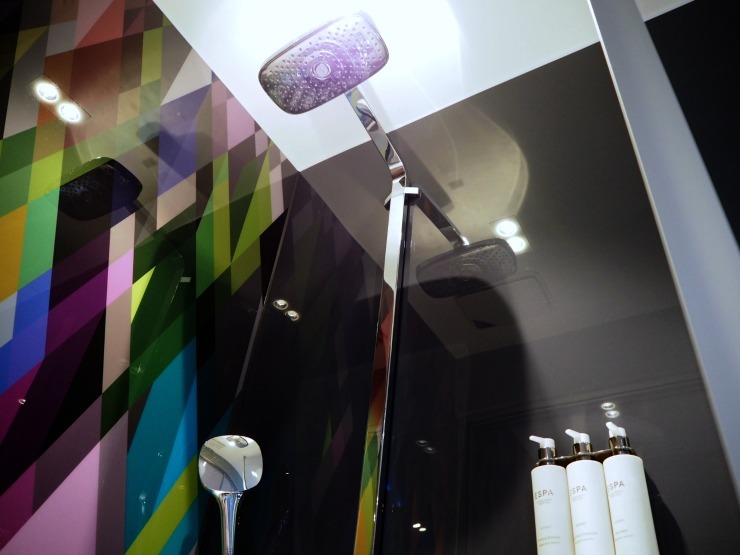 The Dyson was super quick at drying hair, which for £300 if you had to buy one, I would definitely want it to be! 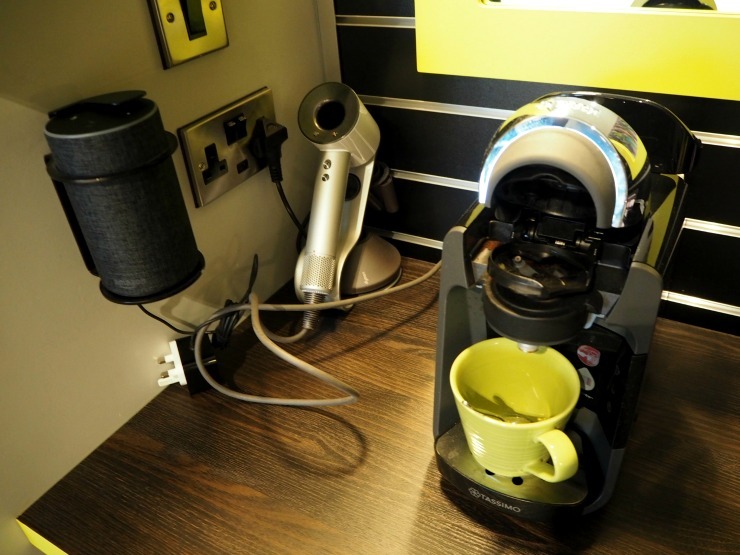 The Tassimo was great and came with a range of pods as well as sugar and milk for those coffee hits. The Alexa was a little temperamental. They are always like this though and we had fun asking it questions. 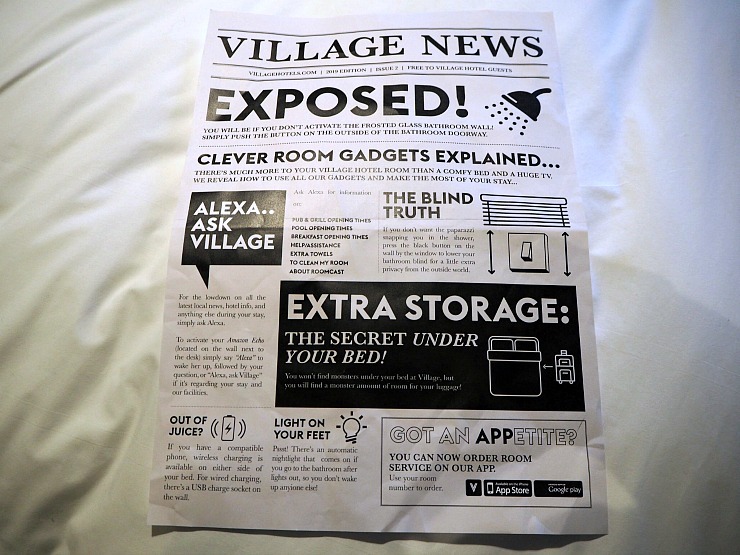 If you said "Alexa, Ask Village...." and any questions about the hotel it would tell you the answer. A nifty feature. The TV was a massive 55inch HD TV and came with Sky Sports and movies as well as all the usual channels. 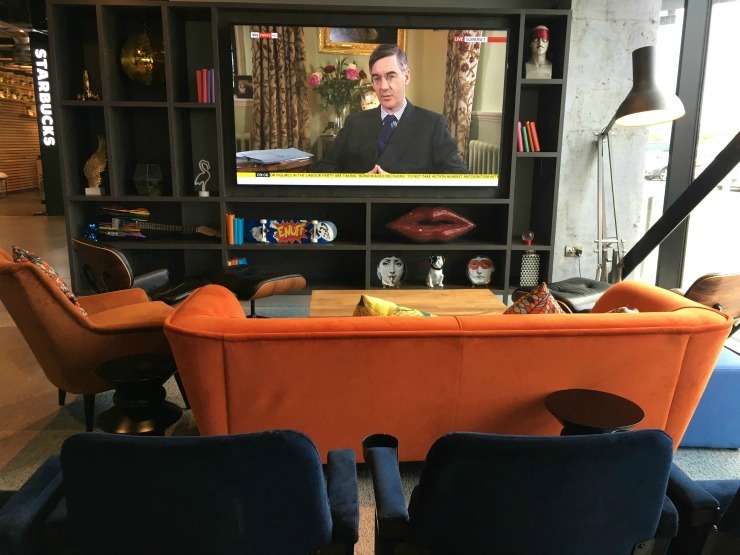 You can also check out of the room on the TV which is useful if you are short of time. A Chromecast was another feature in the room, which allows you to stream from your devices but we didn't use this. 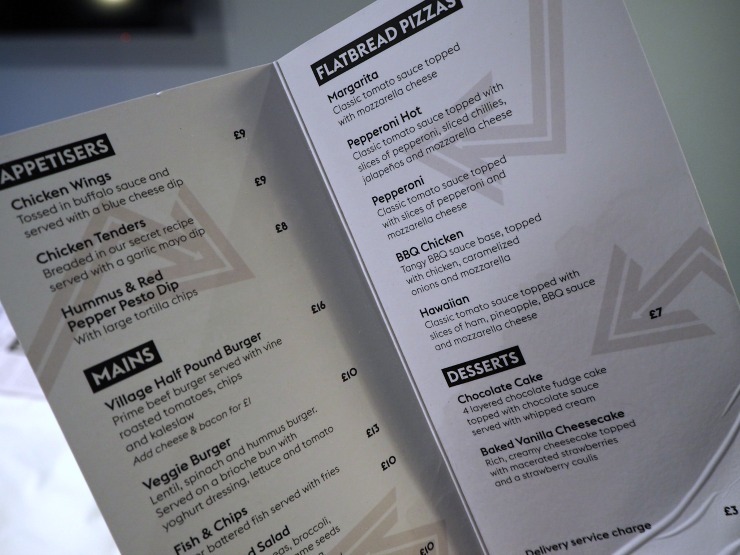 If you want room service there is a menu available and you can order it from the Village Hotel app. The prices for main courses seemed average for a hotel, the starters were a bit more expensive than I thought they would be but the portions are large. So after freshening up, we started to get ready for the evening ahead - an Ed Sheeran and Beyonce tribute act in the hotel's function room. 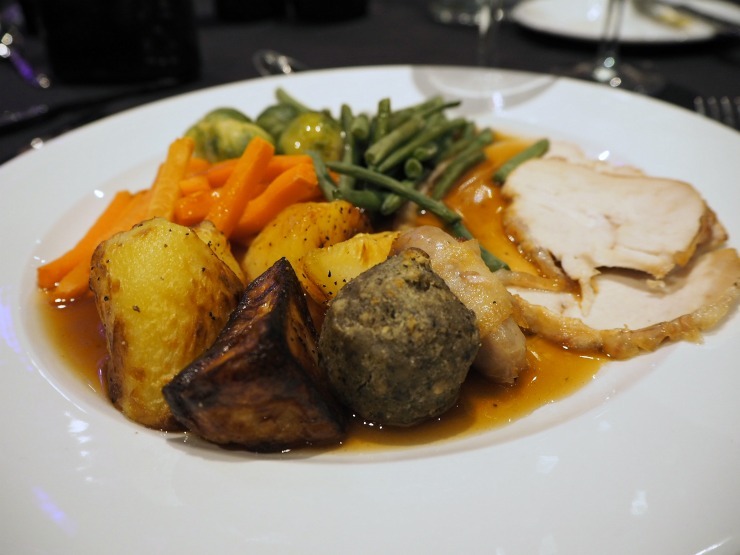 The hotel holds these every weekend and they cost £30 per person including a three-course meal. Drinks are not included but there is a bar available. The room was nicely set out and the tribute acts were good. Even though we are not fans of Ed Sheeran he did look and sound like him and got the crowd going, as did the Beyonce tribute, a very effervescent lady who had so much energy! 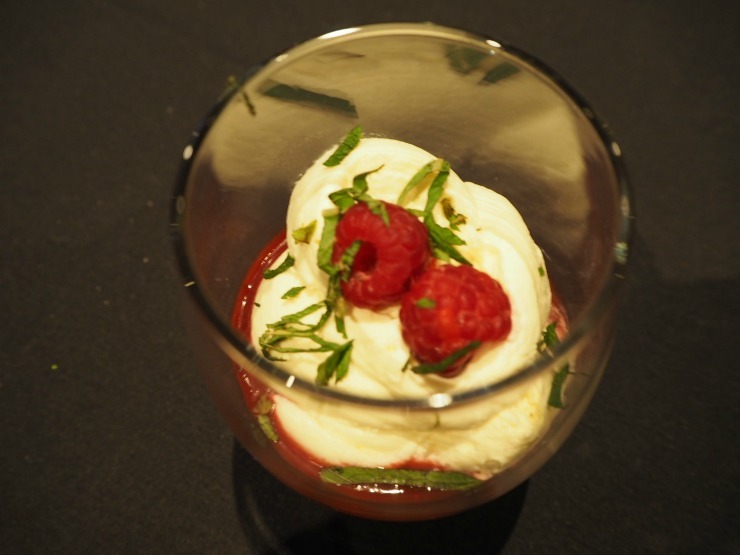 The three-course meal consisted of butternut squash soup with warm bread rolls, a roast turkey dinner and a raspberry and cream mousse. 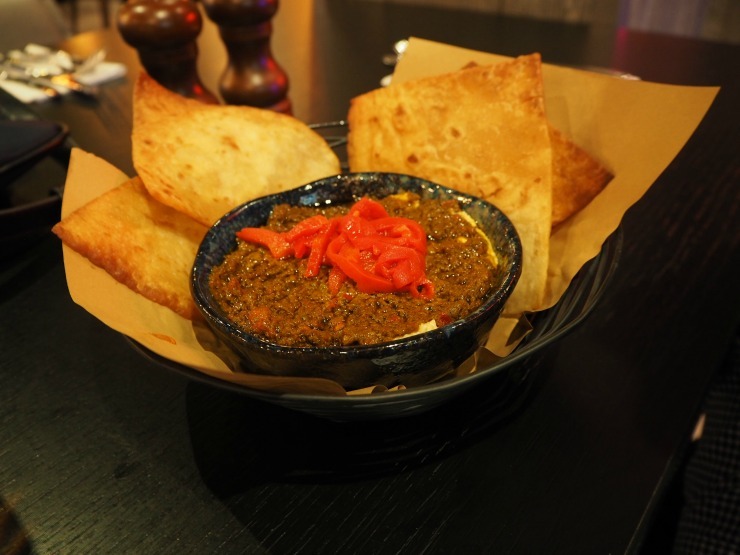 The starter was particularly good and for the price of the meal and entertainment, I thought it was great value. So that night after being well fed and truly entertained we retired to our room and had a great night's sleep. The next morning breakfast was included in our rate and was in the Village Pub and Grill. 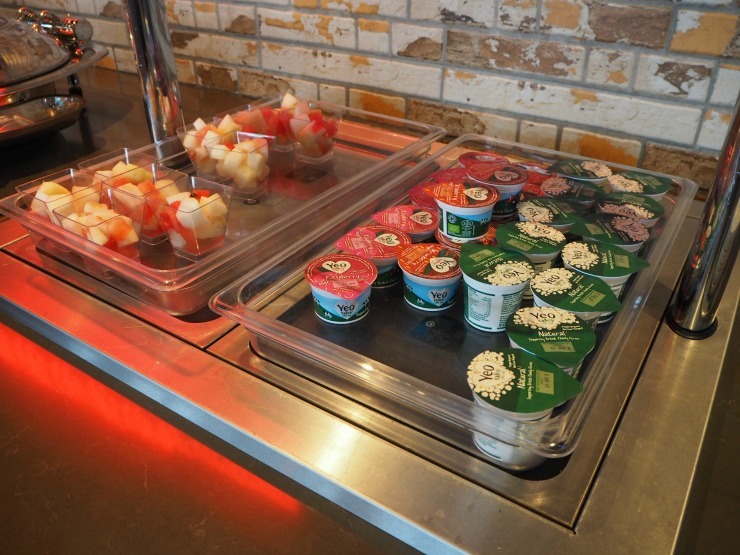 It consisted of a buffet breakfast with a choice of hot and cold food. 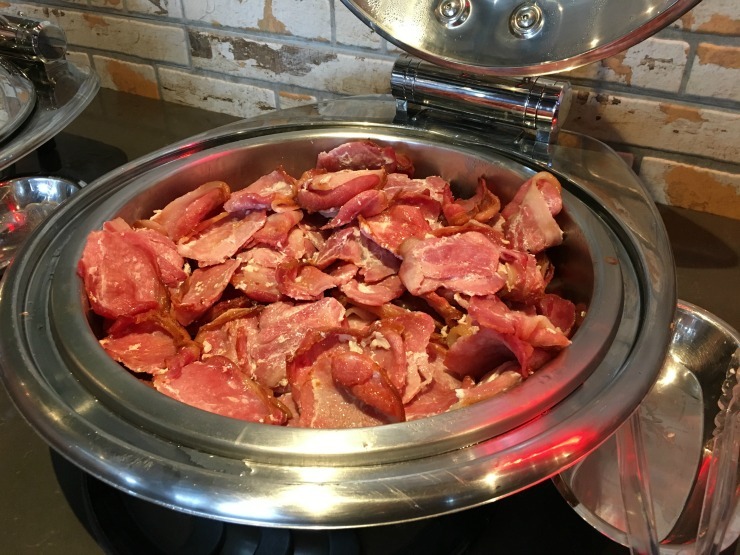 It wasn't a hugely extensive breakfast but it suited our needs and included tea and coffee, long life juices, cereals, yoghurt, croissants and melon as well as bacon, sausages, scrambled eggs, mushrooms and beans. One of the bloggers we were with is gluten intolerant and they did have gluten free bread available as well as soya milk. After breakfast, I went for a swim to work it all off. 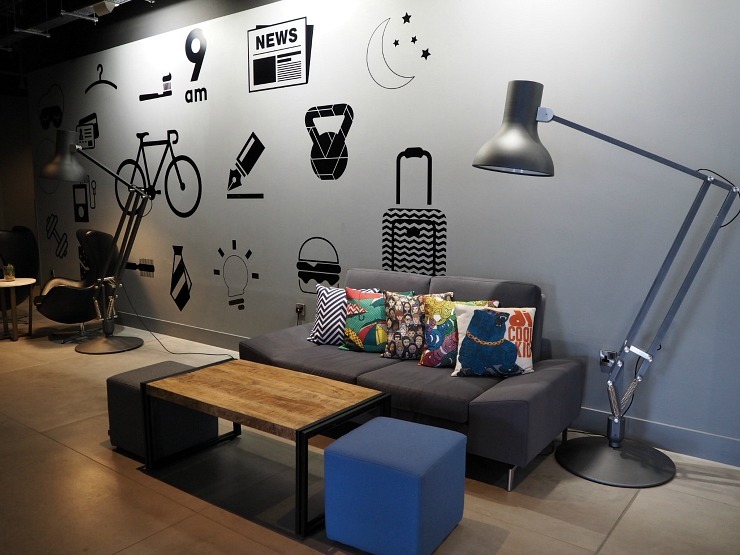 If you are staying in the club room you get the use of the leisure facilities for free. 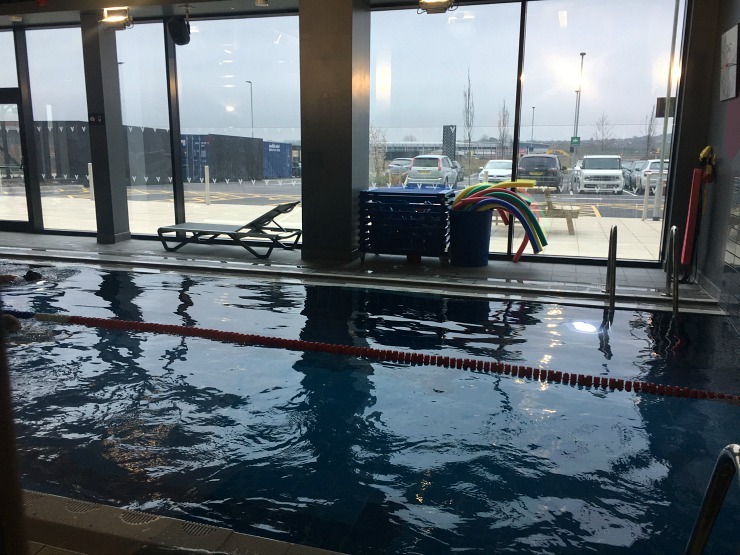 This includes the pool, a state of the art gym, and exercise classes. 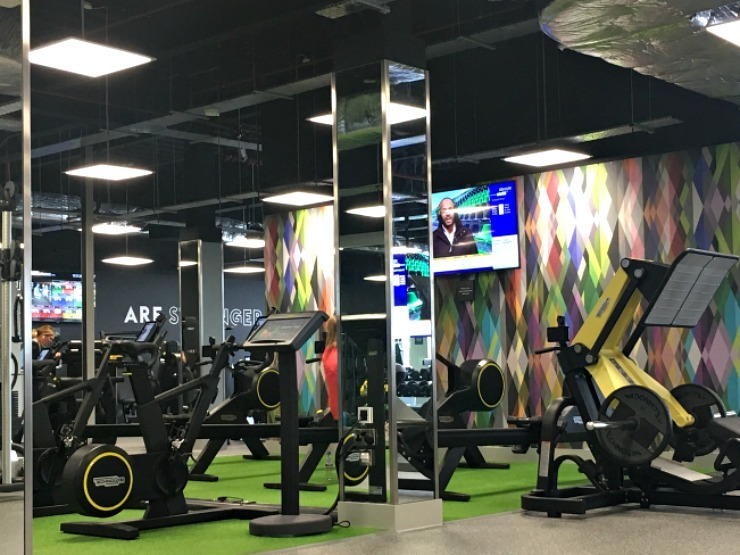 Mr W was very impressed with the gym and if you are a local I think the off-peak rate for a monthly pass is around £35. 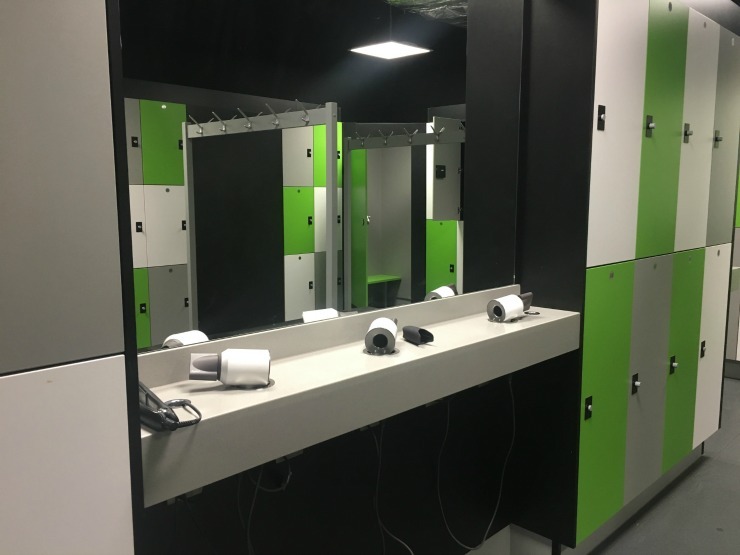 If you have a regular room you do have to pay £5 for access to the leisure facilities. 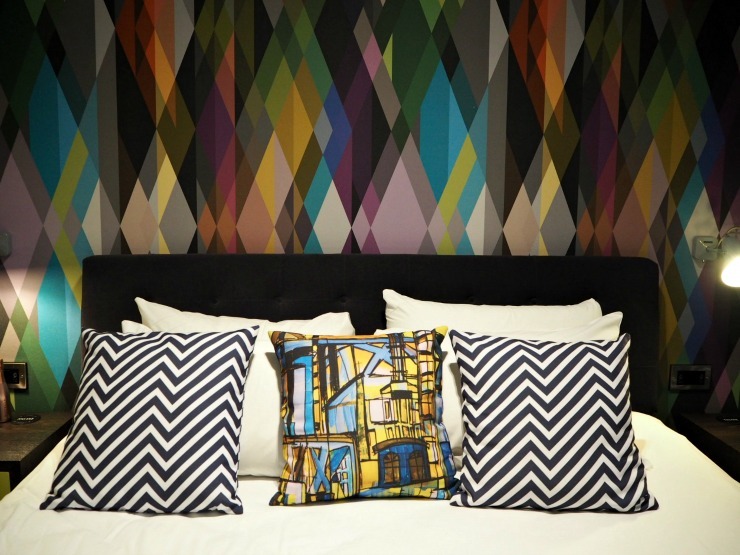 Everything was clean, modern and high-tech and the leisure facilities are a huge plus point if you are staying here. 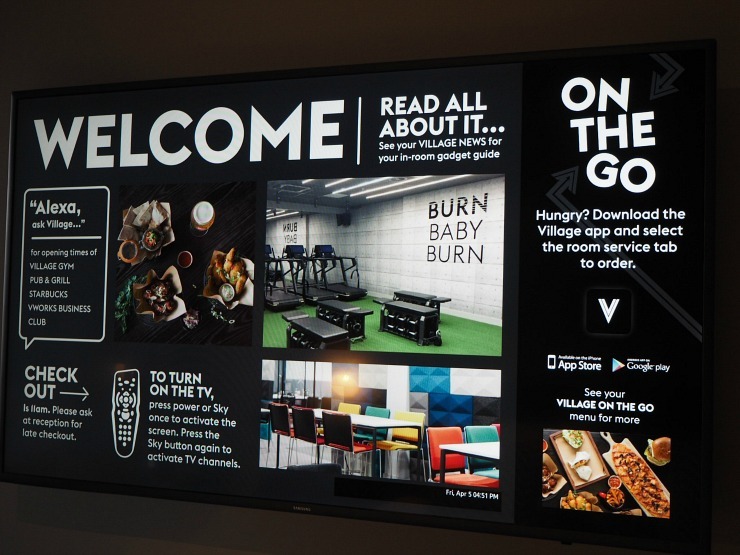 After checking out the pool and gym I popped along to the Les Mills launch event. Les Mills is a fitness programme that runs classes throughout the world. 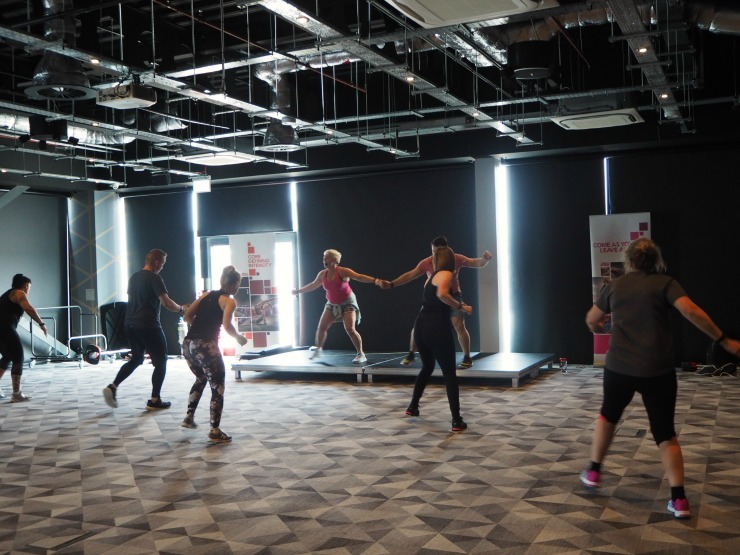 Their mission is to create a fitter planet and their classes from Body Pump, to Body Combat combine exercise to music. Every few months they revitalise their classes and create new moves to keep everything fresh so today was the launch of their new season of classes. 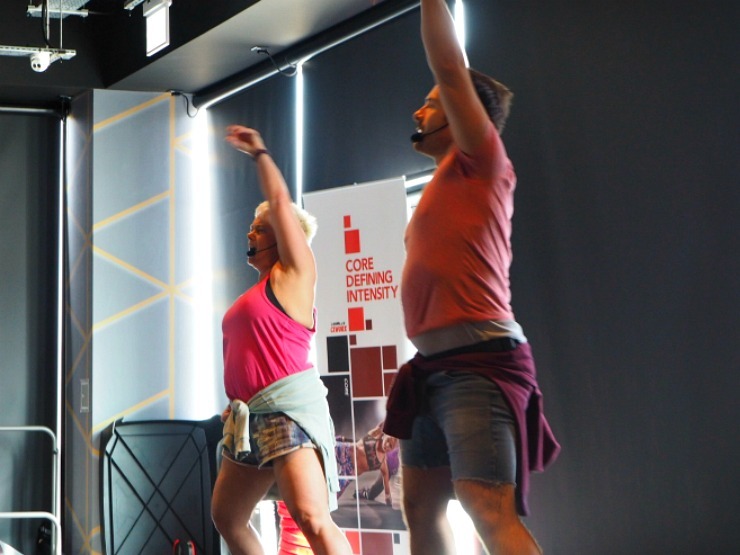 The class had so much energy that I really wished there were Les Mills exercise classes near me. Unfortunately, I live in a small town on the South Wales coast where the average age is 80, but I live in hope! Then it was a quick change and a short ten-minute drive to the Mall at Cribbs Causeway for the Bristol Fashion Show Festival. This ticketed event was a lot of fun. 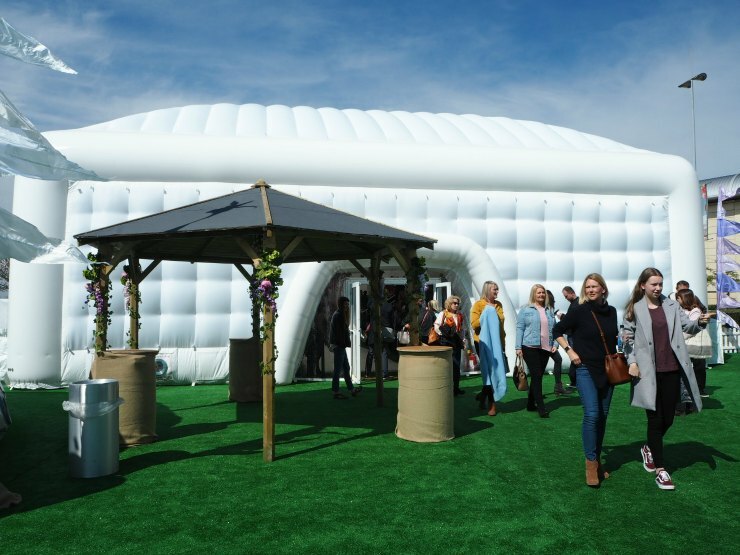 As well as the tents that included beauty and style makeovers you got three 30 minute events - a catwalk show, a styling workshop and Caryn Franklin, TV presenter and broadcaster in conversation with some of the top UK fashion influencers. 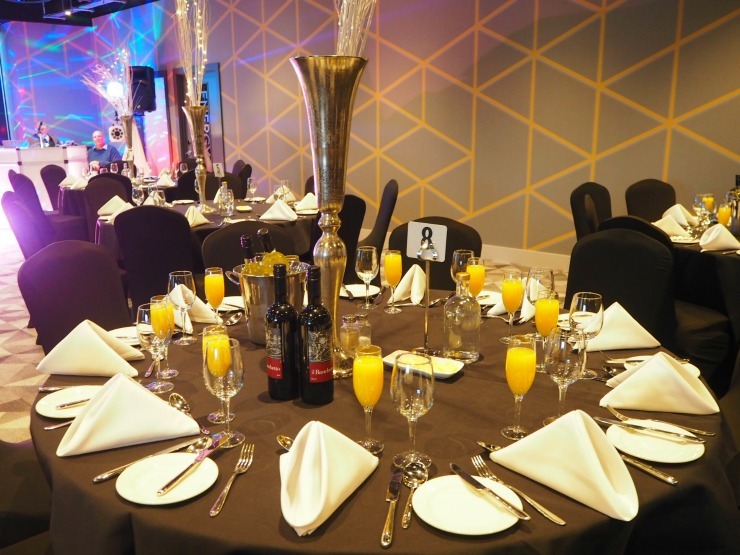 I was greeted at the entrance and offered a complimentary soft drink or glass of bubbly. A nice touch! I booked myself in for a free 10-minute style consultation. I was asked which styles I like and was shown some of the new designs out this season. I think I probably needed to be more specific in what I wanted out of this session, as I wanted to be shown items I wouldn't normally wear. If you wish to do this in future I would go for the more in-depth style consultation for 30 minutes at a small charge. After this, I went into the beauty hall. 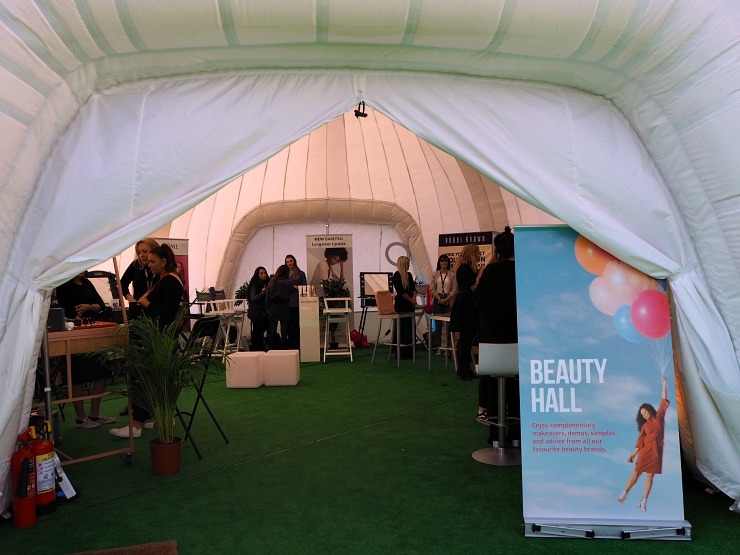 There were makeovers, beauty treatments and hair being styled by companies such as Lush, Clinique and GHD. 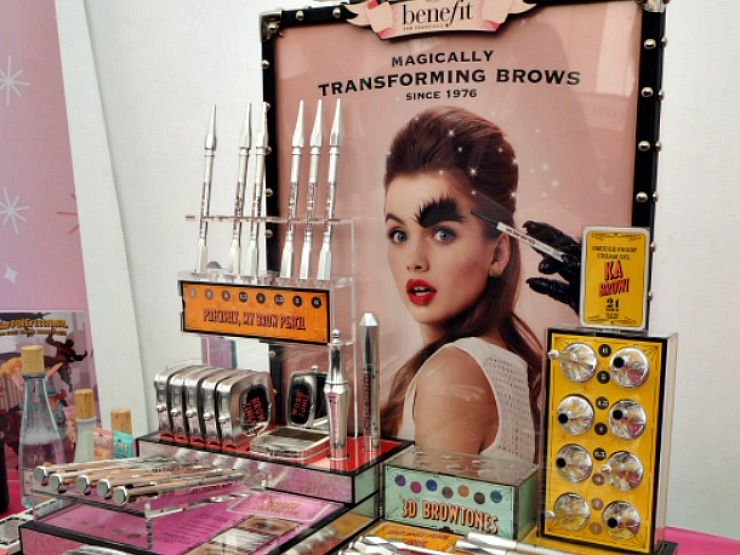 I had a mini makeover at Benefit which I enjoyed. I am a big fan of Benefit and have used a number of their products over the years so I was keen to see what they could do for my eyebrows. The makeup artist was really helpful in explaining how to apply the products and how to shape my eyebrows. I always struggle to get my brows just right and with the help of Gimme Brow volumizing eyebrow gel and Precisely My Brow eyebrow pencil, my eyebrows looked the best they had ever been. Then it was time for the first event, a discussion with Caryn Franklyn in conversation with Sonny Turner and Zoe De Pass, two fashion influencers. Sonny is an influencer that has curves and who celebrates body positivity, whilst Zoe is a London based content creator that works on changing misconceptions that being a mum doesn't mean you have to dress 'mumsy'. Anecdotally people seem to see influencers like this as a relatable side of fashion. Not everyone is a size 8 and 5 foot 10 and women want to see other people that look like them in the fashion industry. Caryn asked how many people there read blogs and almost all the hands went up. 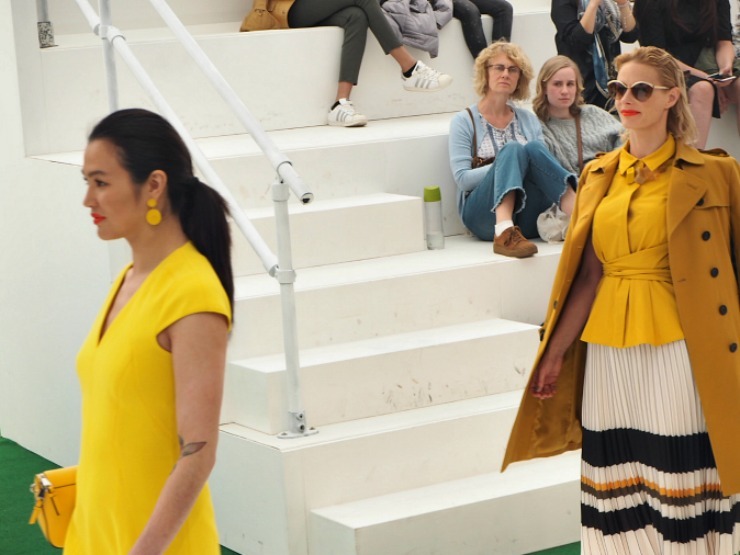 Sustainability and ethical fashion were flagged up as an area to watch. Caryn suggested that you ask your favourite fashion brand what they can tell you about their carbon footprint about their worker's conditions. When they are asked this on a regular basis it may make them realise people want change. Next off, it was time for the catwalk show. 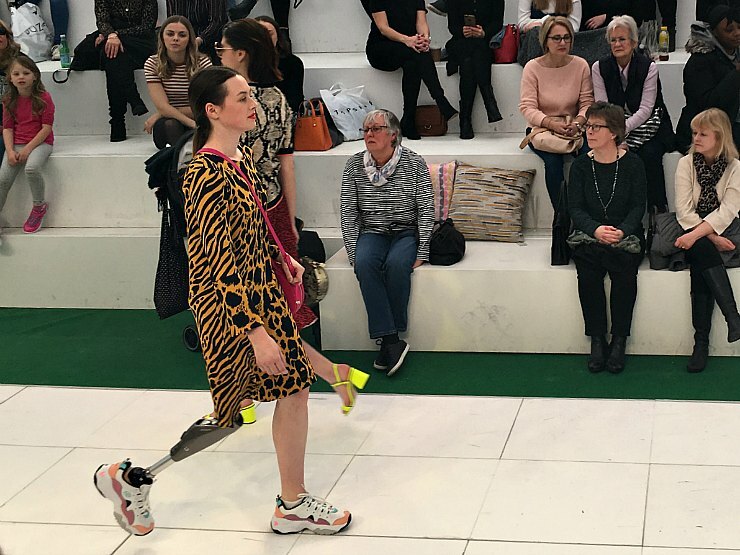 I was impressed with the diverse range of models used, of all shapes, sizes and ages, with abilities and disabilities and with different skin tones. 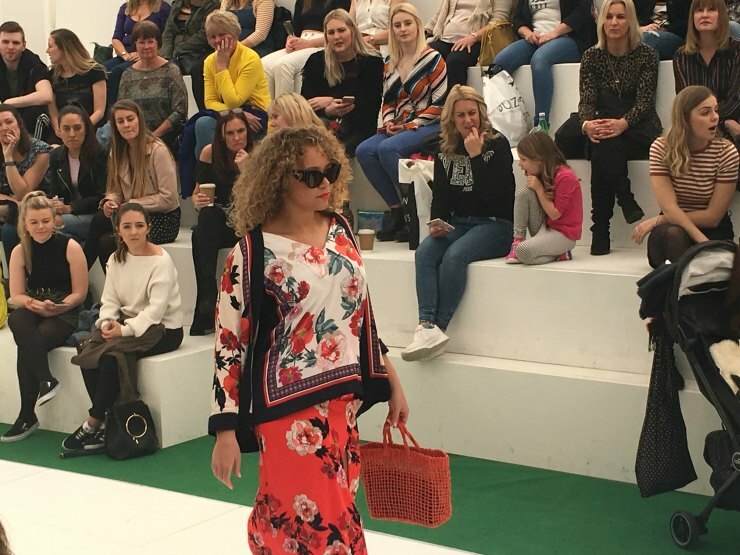 Spring/Summer designs for 2019 I loved included Florals, Print Mix, New Neutrals and Going Wild. The last session was a styling workshop where the founder of the Image Consulting Co, Emmeline Stevens talked about fashion to help you feel good about yourself. 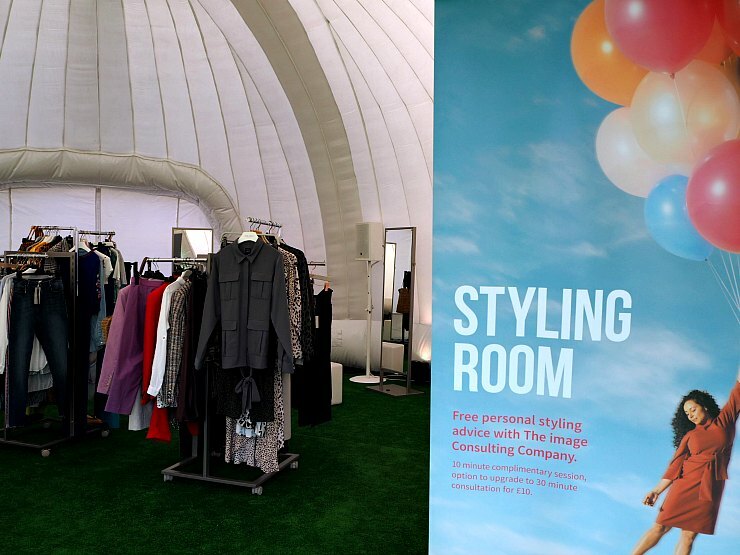 The Bristol Fashion Week Festival was a fun event that was worth going to. I loved the interesting discussion with Caryn Franklin and the influencers about body positivity. This is one area that the fashion industry really needs to change, using models of all shapes, sizes and appearances to reflect society. 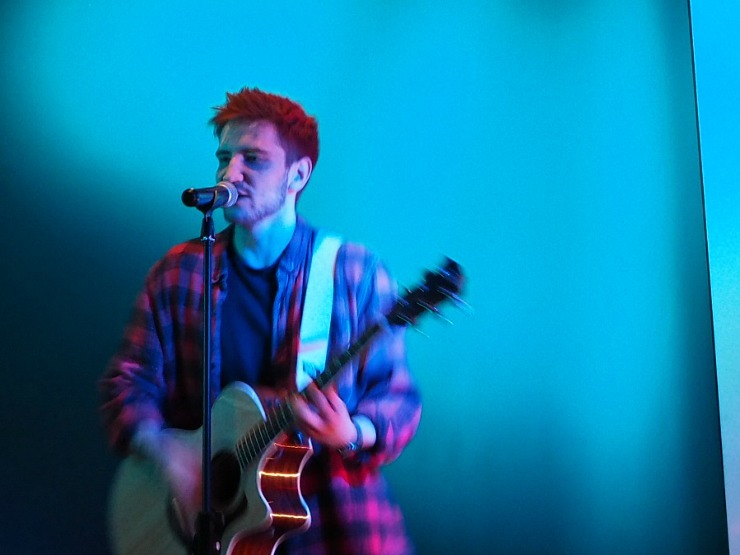 Tickets were priced at £15.50 with 50 pence going towards the Be Real Campaign that works towards changing attitudes to body image and putting health above appearance. This charity works with schools, individuals, businesses and public bodies. A very worthwhile cause. So then it was time to head back to our hotel. That evening we met with the manager Mark and sales manager David for our evening meal. Mark and David were obviously proud of their hotel and David talked passionately about the work of Village Green and how the Village Hotel Club Bristol are starting to work with the local community and disadvantaged youths. I didn't realise that the Village Hotels support their local communities in this way, so this was a nice surprise. So onto our meal. 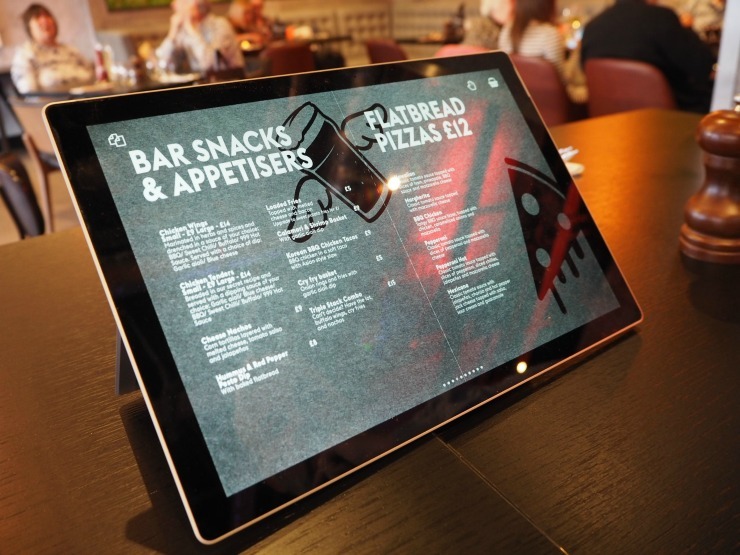 You can order your food on an Ipad provided, the Village Hotel app or at the bar - a great use of technology yet again. 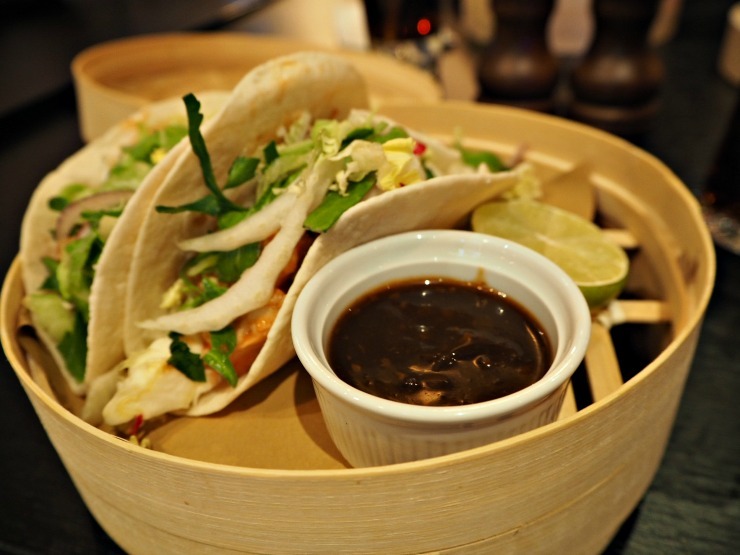 We ordered hummus and Korean BBQ chicken tacos for starters. The tacos were good but the real star was the hummus which was topped with a delicious red pepper pesto. Served with tortilla chips it made a substantial starter. Mr W had chicken peri-peri skewers next and I had the half pound burger. The skewers were good and the spicy sauce took the dish up a notch. 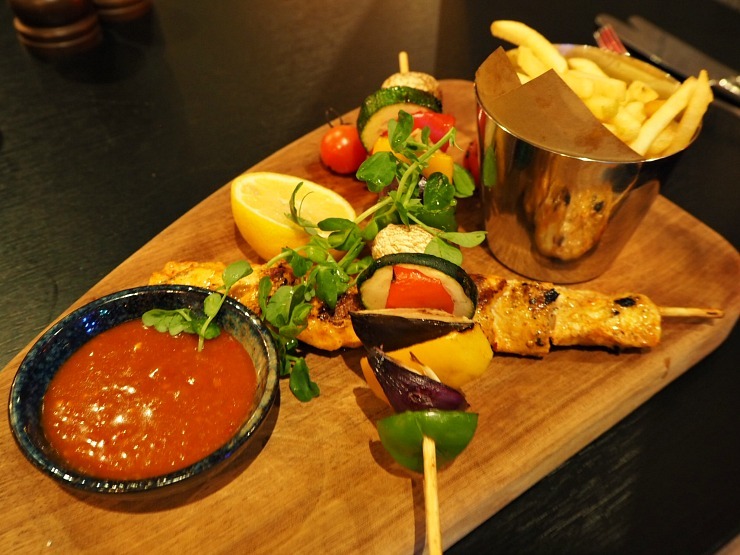 Not for the faint-hearted when it comes to heat! 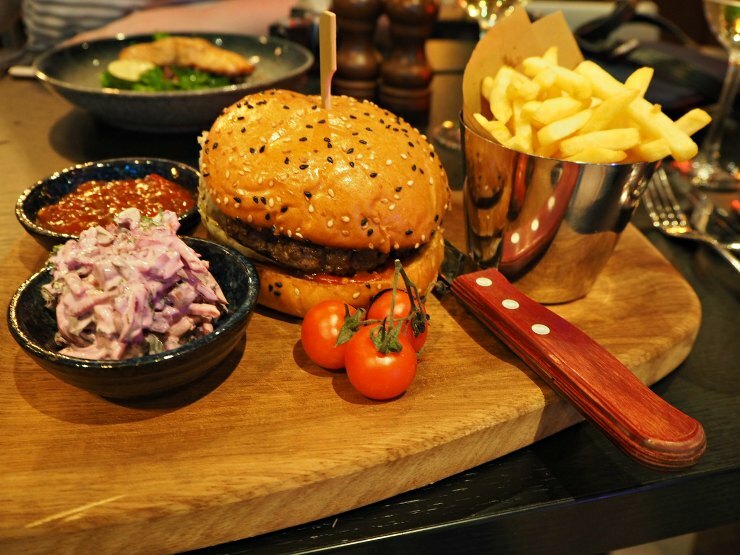 The burger was made with good quality beef, and although slightly overcooked came with a great kale coleslaw. Fries were lightly cooked and crispy and were excellent. Desserts available sounded delicious and included a baked vanilla cheesecake with strawberry sauce and a four-layer chocolate fudge cake with whipped cream. We were too stuffed to try any, unfortunately. So time for bed again, and after breakfast the next morning, it was time to check out. 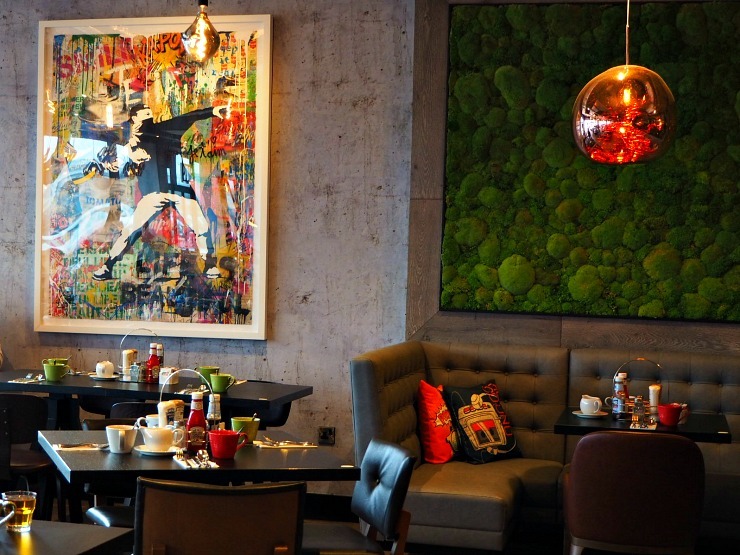 We enjoyed our stay in Bristol for the Bristol Fashion Week Festival. 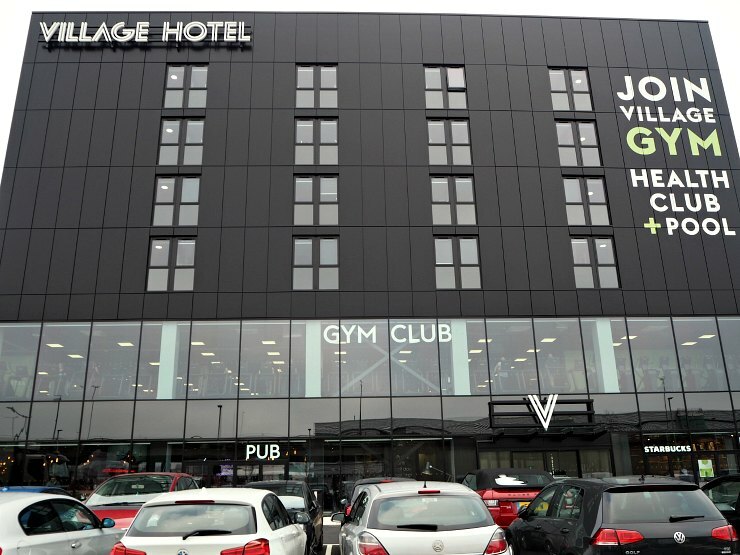 The Village Hotel Club in Bristol is a great hotel, close to the Mall at Cribbs Causeway and a short drive from the centre of the city. 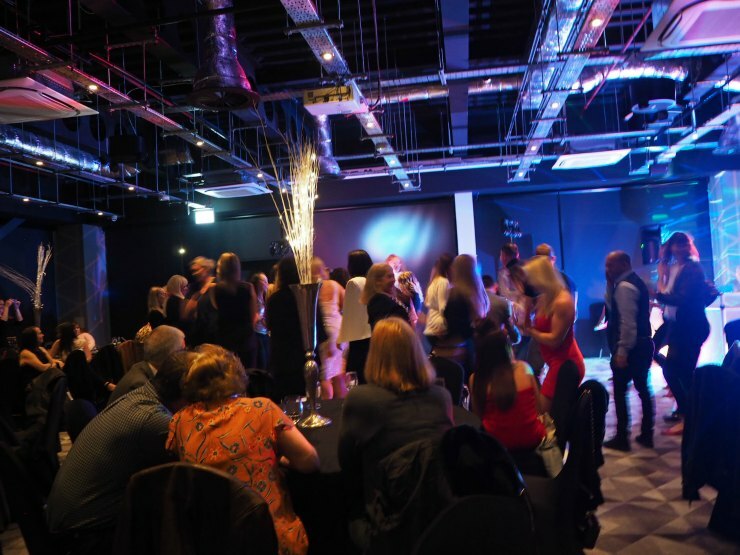 The club rooms are bright in design and technologically advanced. The leisure facilities in this hotel were some of the best we've ever experienced for a moderately priced hotel. Check out the video below that Mr W created for our dedicated travel blog Fly Drive Explore. If you love fashion, I also highly recommend the Bristol Fashion Week Festival, which had a great body positive message. I would definitely visit both the hotel and the festival again in the future. 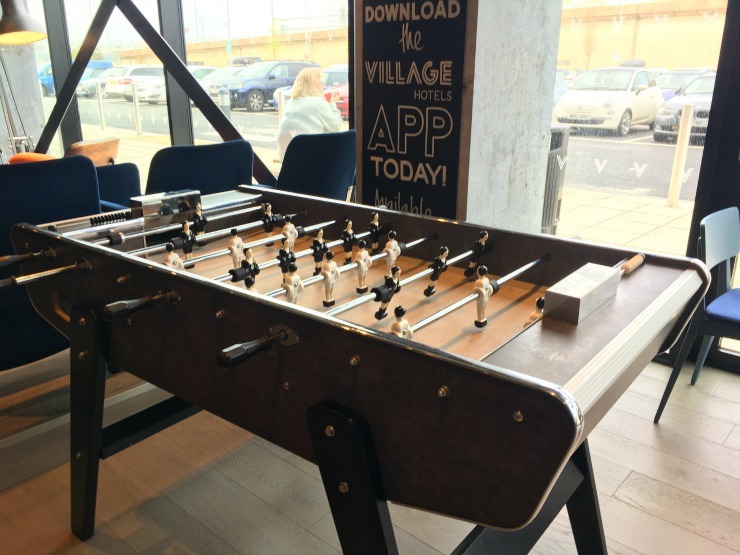 Let me know, what do you think of the Village Hotel Club Bristol? 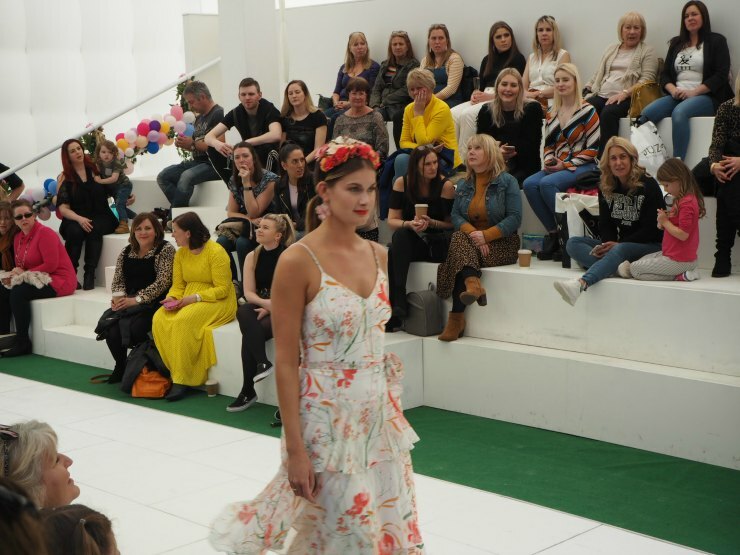 Would you visit the Bristol Fashion Week Festival next year? * This was a press trip, I was not paid for the trip and all opinions are my own.